Today I had a Gyro for dinner. A Gyro is a type of fast food in Greece. It is one of my favorite types of food and I like to eat it as often as I can. It is called a Gyro because the meat that is in it is cooked on a pole that goes round and round and Greeks they say Gyro Gyro and that means round and round so they call this dish a Gyro! my mum went to the restaurant called Oregano and go the ordered the Gyro at a counter for takeout. She then brought the food home, and we sat down at the table with my great uncle Tony, my mum of course and my mum’s friend Howard. The Gyro is presented in a paper wrapping that goes all the way around it to hold everything in it. I eat it by peeling back the paper and taking a bite out and repeat until all the food is gone. I eat it fast, it probably took around 3 minutes to finish eating it. 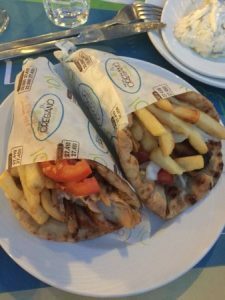 A Gyro smells really nice, it has tzatziki, pork, French fries, and pita bread wrapped around it, it is warm and tasty! After we finished eating we cleared the table and I went and played video games and the adults watched the sunset and talked. I’m so impressed you’ve posted in the blog! Great work. Those gyros look delicious and I bet they taste better then any I could find in Coquitlam. I wonder what desserts they have in Greece? Are you eating baklava everyday? It’s funny how some things are different wh n we travel and some are the same – like the kids playing video games after dinner. Everyone at Scott Creek is busy getting ready for Carnival. It suddenly is super hot and sunny here too – about 25 degrees for the past three days. I have posted a new entry, I went to the beach so I posted about that. Also, I’m glad you liked this blog entry!